Much of what we know about Roman Britain, and especially about the 1st Century AD, is based on archaeological evidence. There are, however, at least some references to the British Isles in historical sources. Care needs to be taken in the way in which we read these references, since no classical "historian" was a historian in the way that we understand the word today, and some of the ancient sources are not really "primary" sources in any case. We draw clear boundaries between "academic history," "popular history," "journalism" and "historical fiction," but classical writers did not, and regularly hopped back and forth across them. It is in the works of Tacitus (56-c125 AD) that we come closest to a real primary source for Britain in the 1st Century AD, although he never came to Britain, and believed it to be much closer to Spain than it actually is, with Ireland lying between. He was a historian in the tradition of Thucydides, which is to say that he comes closer to the "journalistic" than to the "historical fiction" end of the spectrum, writing mainly about events that happened during his lifetime, or during the previous generation (his Annals cover the period 14-68 AD, one of the few Roman sources to mention the execution of Christ; his Histories cover the period 68-96 AD) and informing himself, in all likelihood, through interviews with those directly involved. Elevated by Vespasian to senatorial rank, he almost certainly had access to the Acta Senatus, the Roman equivalent of Hansard, no part of which survives today. "He...gave private encouragement and official assistance to the building of temples, public squares and good houses...and so the population was gradually led into the demoralising temptations of arcades, baths and sumptuous banquets. The unsuspecting Britons spoke of such novelties as 'civilisation,' when in fact they were only a feature of their enslavement." The note of cynicism (there are other examples) is typical not only of Tacitus, but of Roman attitudes to conquered peoples more generally (one of the earliest depictions of Britannia shows her not ruling the waves, but being violently assaulted by the Emperor Claudius). The substance of what Tacitus says, however, is borne out by the archaeology. An inscription in the Verulamium Museum makes it clear that it was under Agricola that the forum of St Alban's was rebuilt, a full twenty years after it was burned by Boudicca. He may, similarly, have been the first successfully to rebuild London, although his predecessors clearly attempted it. 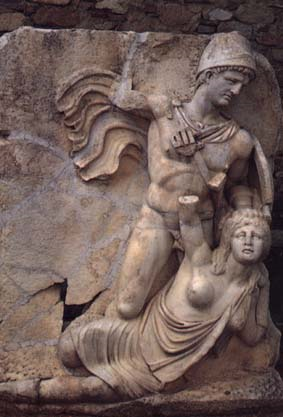 Relief of Claudius subduing Britannia, from Aphrodisias (modern Turkey). Photo: Marie-Lan Nguyen. "We, the most distant dwellers upon Earth, the last of the free, have been shielded till today by our very remoteness...Now the farthest bounds of Britain lay open to our enemies...Pillagers of the World, they have exhausted the land by their indiscriminate plunder, and now they ransack the sea...To robbery, butchery and rapine they give the lying name of 'government,' they create desolation and call it peace." It is very unlikely that any Roman heard the speech that Calgacus really gave, and less likely still that any such spy was taking notes. Rather it must be seen as an early example of a literary tradition of fictionalised speeches that reaches its high point in Shakespeare's Julius Caesar and Henry V.
Agricola's Scottish campaign, as reconstructed from Tacitus's account. There is some archaeological evidence to support this, although the scale of Agricola's "victories" may have been exaggerated. Mark Patton's novels, Undreamed Shores and An Accidental King, are published by Crooked Cat Publications, and can be purchased from www.amazon.co.uk and www.amazon.com. 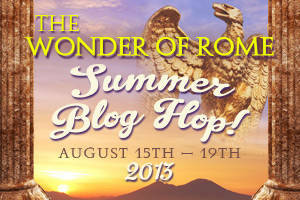 One of the things that stands out from the recent "Wonder of Rome" blog-hop is the consensus that exists among those of my fellow authors who commented directly on Rome's emperors, that Vespasian was one of the best. One can, perhaps, overstate this (he was, after all, a military dictator who, among other things, brutally suppressed a Jewish insurgency) but, when judged against other Roman emperors, he was certainly one of the most successful, and his ten year reign bought peace and prosperity to the empire. He is also one of very few Roman emperors to have spent a significant period of time in Britain. 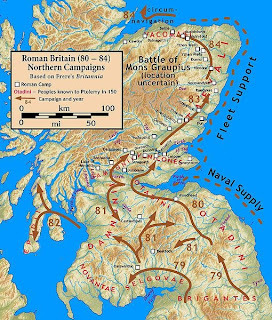 He commanded the II Augusta, one of the four legions involved in the Roman invasion of Britain in 43 AD, and probably remained on British soil for four years. The only detailed account of the invasion is by Cassius Dio, writing 150 years after the event. He has both Vespasian and his brother, Sabinus, playing key roles in the battles fought at the crossing points of the Medway and Thames. 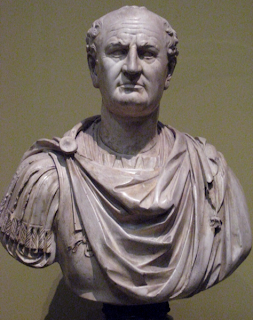 What is more certain, because the movements of the II Augusta have left their traces in the archaeological record, is that Vespasian spent most of his four years in Hampshire, Dorset and Devon. The Durotriges of Dorset, in particular, put up fierce resistance, and here Vespasian would have been in his element, since he was campaigning in a landscape dominated by hill-forts, just as Julius Caesar had done in Gaul. All educated Roman men had read Caesar's account, and Vespasian may well have carried a copy with him. Sir Mortimer Wheeler, who excavated the hill-fort of Maiden Castle in the 1930s, found a cemetery there with the remains of fourteen people, some of whom had clearly died in action against Vespasian's troops. 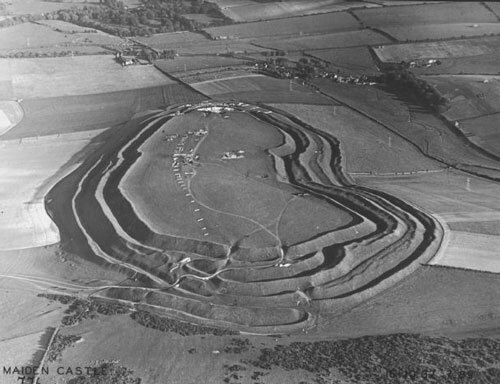 He painted a vivid picture of the fall of the hill-fort itself, but there is little real evidence for this, and it is just as likely that these warriors fell elsewhere, and were simply brought back to Maiden Castle for burial. 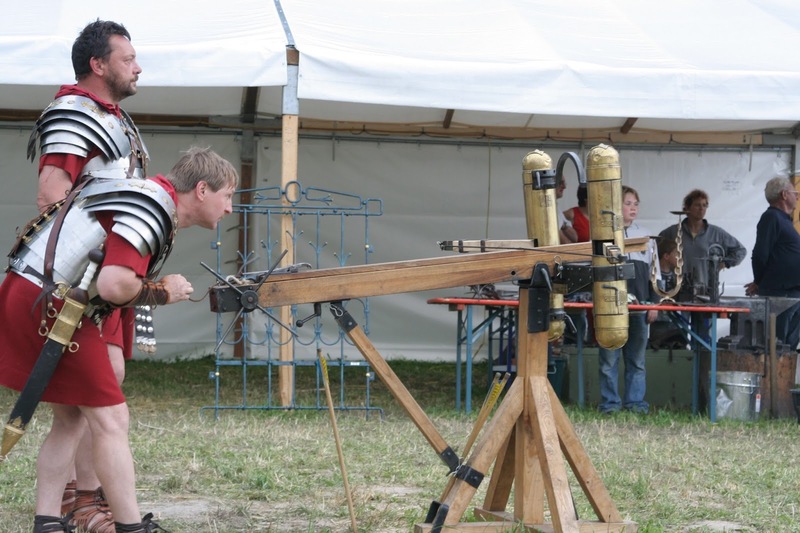 More convincing evidence for a Roman attack comes from the hill-fort of Hod Hill, where eleven Roman ballista bolts have been found. In both cases, Vespasian seems to have required the inhabitants to leave their fortified enclosures and re-settle elsewhere, leaving small garrisons to guard against any possibility of their return. Maiden Castle, Dorset. Credit: Ashmolean Museum (public domain). A reconstructed Roman ballista. Credit: Matthias Kabel (GNU). Vespasian, however, seems to have understood the importance of winning the peace as well as the war. It seems likely that it was he who cultivated and befriended the British king, Cogidubnus, and persuaded the Emperor Claudius to grant him the title, "Great King of the Britons." Whether this gave him any real power over other client rulers, such as Prasutagus of the Iceni, or Cartimandua of the Brigantes, is unclear, but he must certainly have been Rome's man. "...the inhabitants of Sepphoris of Galilee met him, who were for peace with the Romans. These citizens had beforehand taken care of their own safety and, being sensible of the power of the Romans, they had been with Cestius Gallus before Vespasian came, and had given their faith to him, and received the security of his right hand, and had received a Roman garrison; and at this time, withal, they received Vespasian, the Roman general, very kindly and readily, and readily promised that they would assist him..."
Josephus himself had been leading an army against the Romans, but was captured and brought before Vespasian. "...he did not set Josephus at liberty from his hands, but bestowed on him suits of clothes and other precious gifts; he treated him, also, in a very obliging manner, and continued to do so..."
With the expansion of the Roman Empire in the 1st Centuries (BC & AD), the peoples of northern and western Europe found themselves, for the first time in their history, within the compass of a trade network that was truly international, rather than simply regional. Silks from China and spices from India would have been traded in the market-places of York and Exeter. Lead from north Wales was used to make the pipes that fed the bath-houses of Cyprus and Egypt. Wine and olives from Italy and Spain were consumed in the dining rooms of villas at Chedworth and Lullingstone. 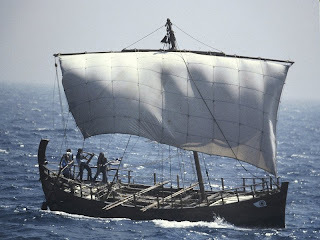 Most of the trade between north-western Europe and the Mediterranean world was by sea, and we know something of the craft that plied this trade, and of the men who sailed them, both from archaeology and from historical sources. Commerce was not a "respectable" occupation for wealthy Roman citizens, so ship-owners and captains were, for the most part, either freed slaves or foreigners, including Greeks, Cypriots and Phoenicians. Most of the ships that are known from the archaeological record were small coastal freighters, 20-25 metres in length, with a single mast. They typically had two steering oars connected by long tillers. Lucian tells us that one such ship "...depended for its safety on one little man, already a greybeard, who turned those great steering oars with just a skinny tiller." 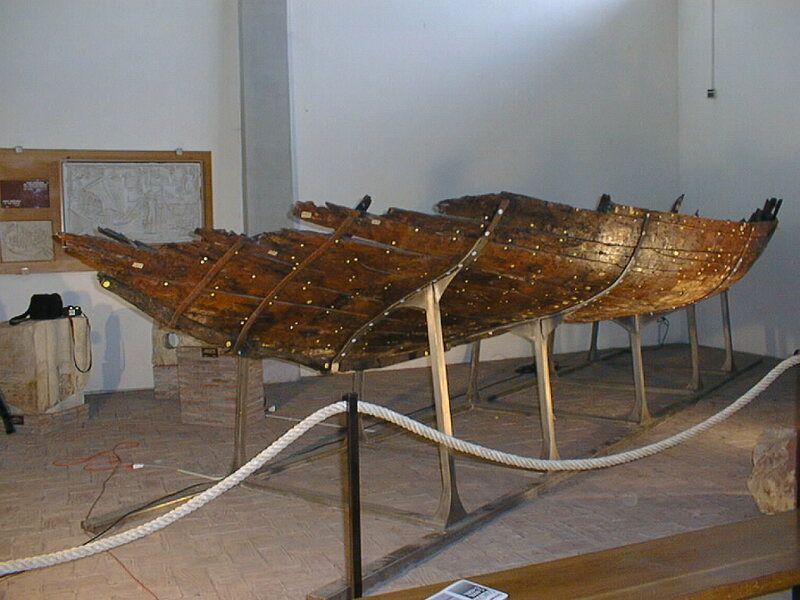 The Kyrenia ship, found off the coast of Cyprus, is pre-Roman (3rd Century BC), but is very similar to the Roman ships found in the ancient harbours of Pisa and Fiumicino. From the personal effects found in her cabin, it is believed that she had a crew of four men. Many of these ships had no galley or firebox, so the crew probably came ashore each night to cook their meal. Kyrenia II, a working replica of a trading ship of the 3rd Century BC. 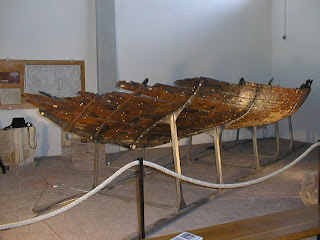 Fiumicino IV, part of the hull of a Roman freighter. Such ships undoubtedly sailed between London or Chichester and ports along the coastlines of modern France, Germany and Belgium. The cargo ships that braved the Bay of Biscay, however, were probably much larger. We get a glimpse of such vessels in the wreck from Le Grand Conglue, near Marseille, which was around 40 metres in length, and dates to the early 1st Century AD. These ships carried passengers as well as cargo, but on a casual basis, negotiable with the captain. 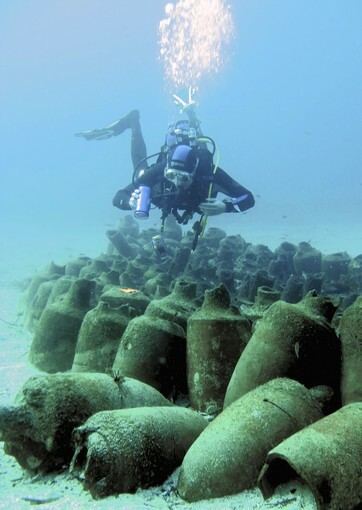 The Grand Conglue wreck, with amphorae used for the transportation of wine or olive oil. Passenger travel, however, was not for the faint-hearted. Travellers brought their own food, wine and bedding on board, and their own slaves to cook their meals in the ship's galley. They slept in improvised shelters on the deck. Synesius, writing in the 5th Century AD, describes one such voyage, on a ship with a crew of twelve. The crew were "...ordinary farm-boys who, up to last year, had never touched an oar..." and "...the one thing they all shared in common was having some bodily defect...they made jokes about this, and called each other by their misfortunes instead of their real names - 'Cripple,' 'Ruptured,' 'One-Arm,' 'Squint.'" "The men groaned, the women shrieked, everybody called upon God, cried aloud, remembered their dear ones. Only [the captain] was in good spirits. Then someone cried out that all who had gold should hang it around their necks...to provide...money to pay for a funeral...The ship was running along under full canvas because we couldn't shorten the sail. Time and again we laid hands upon the lines, but gave up because they were jammed in the blocks." Travel by sea, however, was significantly faster (and therefore cheaper) than travelling overland. The fastest voyage on record was from the Straits of Messina to Alexandria in six days, an average travelling speed of six knots, allowing the ship to cover 100-135 miles per day. This, however, was evidently with the most favourable of all possible winds. Mark Patton's novels, Undreamed Shores, An Accidental King, and Omphalos are published by Crooked Cat Publishing, and can be purchased from Amazon. What do we know for certain about the Roman invasion of Britain? That it happened in 43 AD; that it involved four legions under the command of General Aulus Plautius; that the Emperor Claudius himself arrived at a late stage, accompanied by a number of elephants; and that he took the surrender of a number of British tribes at Colchester. That's about it. Where did the legions land? Richborough in Kent is the answer most often given, and supported by the evidence of a substantial fort and supply base, ditches that may have protected a beachhead and the presence of a substantial triumphal arch. The most detailed account is that given by Cassius Dio (written 150 years after the event), and it is certainly consistent with a march west and north, subduing the Cantiaci, the Trinovantes and the Catuvellauni, with key battles at the crossing points of the Medway and Thames. That, almost certainly, is part of the story, but is it the whole story? The beachhead protected by the fortifications at Richborough is about 700 metres in length. Was that really sufficient for the disembarkation of the estimated 45,000 men and 15,000 horses and mules that made up the invasion force? Cassius Dio tells us that the invasion was prompted by the flight to Rome of Verica, the king of the Atrebates/Regnenses (probably a single people by that point in time), under pressure from Caratacos of the Catuvellauni. 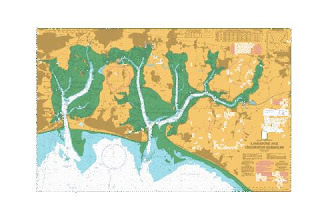 This has led some to suggest Chichester Harbour as the landing point for at least part of the invasion force. 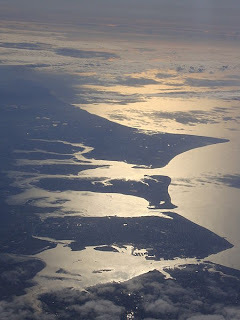 The important point about Chichester Harbour is that it was on friendly territory. A Roman force marching north through Sussex and Hampshire, with Verica or Cogidubnus (who may have been Verica's son) riding alongside its commander, might well have been viewed as an army of liberation. Silchester, which Caratacos had recently seized, could probably have been taken by a relatively small force, which could then have marched on to the Thames, joining up with Plautius's much larger force that had fought its way through Kent. Crucially, they would also have established a secure line of supply from Chichester's natural harbour. 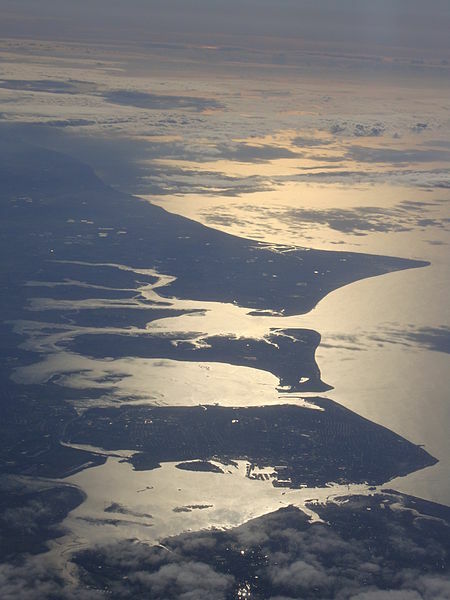 Chichester's natural harbour (photo: John Armagh). Fishbourne is at the end of the uppermost creek. In the early days of my research for An Accidental King, I spent some time around the harbour, trying to see it through the eyes of a Roman commander. This particular commander (it may have been the future Emperor Vespasian) would have had his mind on logistics, not strategy. The fighting was taking place elsewhere. The harbour is a very different place at high and low tide. He would need to know the locations of the deep channels, for which local pilots would have been essential. The mud-flats at low tide are no place for horses or armoured men to be caught out. The areas shaded green on the map are open water when the tide is high, mud-flats when it is low. This commander would have wanted deep-water jetties. Some might already have existed for trading purposes. If there had been prior contact between the Roman commander and Cogidubnus, more could have been constructed in advance. If not, the Roman engineers could probably have improvised them quite quickly. Fishbourne Roman Palace is located at the end of the easternmost deep channel of the harbour. The deepest levels of the excavation, beneath the various phases of the palace itself, revealed the foundations of Roman military granaries, and this may be a pointer to the real significance of the harbour to the invasion plans. The invasion force is estimated to have required 50-70 tonnes of grain per day, almost all of which would need to be imported. It is unlikely that all of this came through Richborough. 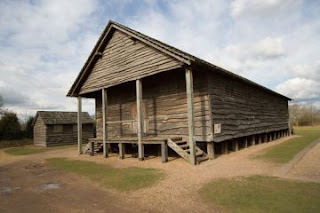 Reconstruction of a Roman legionary granary at The Lunt Roman Fort, near Coventry. It is natural that Cassius Dio should have concentrated on the action taking place in Kent, and that he should have placed Vespasian (by then a god) at its centre. The reality may have been rather different.